His name is Tim. He is a friendly, one-year old terrier mix available for adoption at Orphaned Pets, Inc. in West Caldwell, NJ. I met Tim at the first annual Sound for the Hounds: Puppy Mill Awareness Concert at Brookdale Park in Montclair/Bloomfield, New Jersey. It was an educational and entertaining day in the park sponsored by United Against Puppy Mills with informative exhibits, animal shelter groups, jazz bands, games and prizes. The goal of the concert was to promote the message: "You can stop puppy mills. Adopt don't shop." Normally my blog is focused on cats, but I'm a big dog lover too. I grew up with a golden retriever named Beth. And I believe people should be aware that when you purchase a dog from a pet store you are supporting a puppy mill. Plus, I wanted to help spread the news about this important issue. And how could I not attend, the concert was in my neighborhood! At the end of this post I list ways you can help puppy mill dogs as well as how to put an end to puppy mills. When I arrived at the concert a little after 11:00 in the morning, some of the animal shelter organizations and vendors were still setting up their booths. The venue was centered around Brookdale Park's new dog park. Attendees strolled through the wooded area with their leashed dogs, the pups happily greeting each other with nuzzles and occasional barks. Me: I'm the toughest looking one. A number of people were gathered around a large motorcycle parked on the sidewalk. I recognized some of the fellows from Rescue Ink. I had seen their presentation in Vienna, Virginia at Blogpaws. Their motto is: Action. Education. Advocacy. You might know them from their National Geographic show, Rescue Ink Unleashed. Propped on the imposing bike's seat was Big Ant, a founding member of the organization. The Rescue Ink guys were happy to pose for pictures. I snapped a couple shots for some folks from Animal Rescue Corps who were big admirers of Rescue Ink's dog advocacy. One of the women from Animal Rescue Corps took a shot of me with the tough guys who are real softies when it comes to animal rescue. She also presented me with a temporary tattoo of the Animal Rescue Corps logo. Now I can look like one of the Rescue Ink guys! Later in the day the concert sponsored a Rescue Ink "Dog Look-A-Like Contest." As I walked from table to table, I stopped and visited with the dogs. I asked a representative for Second Chance Pet Adoption League in Morris Plains, NJ if I could pet her dog. She was standing with Noelle, a gentle 6-year-old American Eskimo Dog, who is ready to be adopted. Noelle was saved from a puppy mill in Missouri. Noelle was rescued from a puppy mill in Missouri. She has lived her life until now in a wire cage, in deplorable conditions, having litter after litter of puppies. Poor Noelle had been neglected physically and emotionally. She is a puppy mill survivor. And the reason we have to shut down puppy mills. Boomer from Bukowski/Bloomfield Animal Shelter loves people. I couldn't resist all the shelter dogs looking for their forever families. The dogs really want to give and receive affection. An energetic hound/terrier mix named Boomer said hello to me. He is from the Bukowski/Bloomfield Animal Shelter, in Bloomfield NJ. He would do well in a home as the only dog. I had to leave the concert for a couple hours for an appointment, but before I left I spotted these scrumptious organic treats for cats from Harvest Dog. Why should dogs have all the fun nom-noms? What about the cats! Well, these Kittycakes are garnished with catnip! The ingredients include: Free Range Beef, Organic Blueberries, Organic Wheat Germ, Organic Cream Cheese. And since this is more of a cat blog, I felt I had to mention this organic treat for all the feline gourmands. The company offers these organic treats for dogs: Woofie Pies, Canine Crunch, Grrnola Bark, Woofies and Pupcakes. When I returned to the park, the percussionist King Errisson, who plays the congo drums, and his band were in full force inspiring everyone with their happy vibe. A woman stood swaying to the music. Some of the bands I missed included Zoe, a hot new smooth jazz band; Cindy Bradley, Best New Jazz Artist 2011 and TDC, the Diamond Collection, the ultimate Neil Diamond Tribute band. Although the mood of the concert was festive with all the great bands and the dogs, you couldn't help but be reminded through out the day of why the concert was necessary. 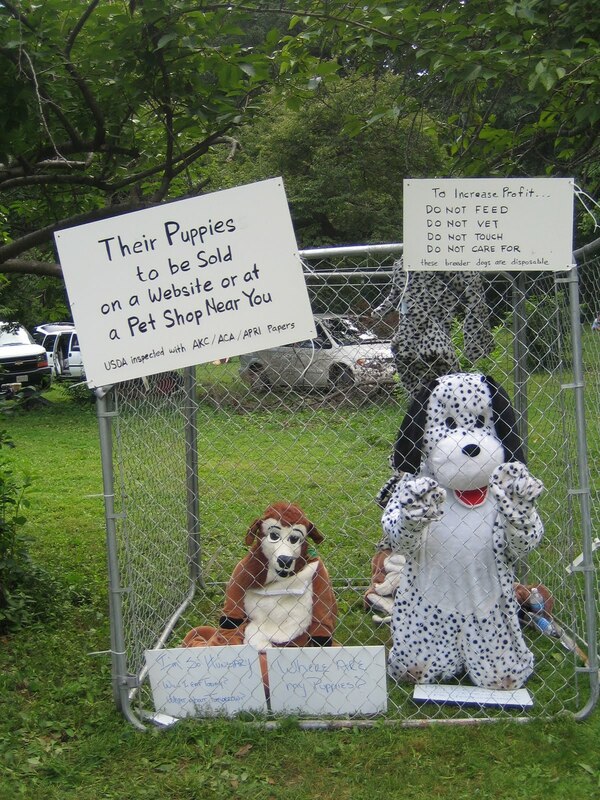 I spotted two volunteers from United Against Puppy Mills dressed in dog costumes sitting in a cage demonstrating the sad life of a puppy mill dog to children. And unfortunately because of my appointment, I missed all the presentations. Helen Ebersole, co-founder of United Against Puppy Mills, an organization founded and organized by residents of Lancaster County, spoke about "The Importance of Advocacy." Beautiful Lancaster County, home of the Amish, is the puppy mill capital of the United States. Bill Smith founder and Director of Main Line Animal Rescue talked about a "Day in the Life of a Mill Dog." You can read about his work rescuing dogs from inhumane Amish puppy mills in People magazine. Smith also got Oprah to do a show on puppy mill dogs by putting up a big billboard in Chicago that read, "Oprah: Do a show on puppy mills. The dogs need you." Although I also missed the "Buyer Beware" presentation by Jenny Stephens, Director of North Penn Puppy Mill Watch, I later was introduced to her. She talked a little about her work. "I refuse to be politically correct," she said when she sees a dog like a teacup yorkie. "You know where he came from. And the problem (puppy mills) is not going away. " You have to admire her passion. Her message to "Be Their Voice" through the group's Saturday pet shop demonstrations. She is also an author of numerous articles on the issues affecting dogs in commercial breeding kennels. North Penn Puppy Mill Watch recommends you boycott stores that sell puppies and refuse to buy any products from them. Animal Rescue Corps was recently founded by Scolund Haisley, dedicated to ending animal suffering through direct and compassionate action. Greyhound Adoption Program in Hampton, NJ finds homes for retired racing greyhounds. Buddy Rescue Foundation rescues abandoned or special needs animals. Hearts United for Animals a national no-kill sanctuary and animal shelter. Sit--Stay and Learn: to promote the humane treatment of dogs through the education of New Jersey's children. As I was leaving, I was greeted by adorable Aggie, a 9-month old wire fox terrier puppy, who hugged my leg looking for a little loving. She wouldn't sit still for me to take her picture, so I swiped (with permission, thank you!) one from her website. 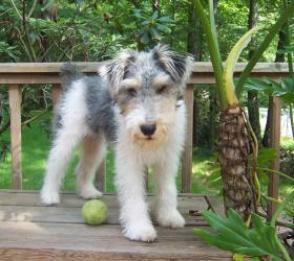 She is from the Fox Terrier Rescue Northeast. Thousands of wonderful dogs--like Tim, Noelle, Boomer and Aggie--in animal rescue shelters across the country, are looking for their forever homes. Don't go to your local pet store and purchase a puppy mill dog. Go to your local animal shelter or to Petfinder.com and find the love of your life. A puppy mill is a commercial dog breeding operation whose sole purpose is to create inventory for pet stores and the public across the nation. They are facilities where profit is placed above the health and welfare of the dogs held hostage for their puppies. You can also help by volunteering your time. United Against Puppy Mills has a dedicated staff working for change in zoning, legislation and public awareness. Donations can be sent to support United Against Puppy efforts here. Remember: Reputable pet breeders do not sell their dogs through pet stores. Mommy sez that was a FANTASTIC post!! She volunteers at a shelter that is working hard to rescue animals from Missouri puppy mills & she's seen some of the animals rescued from those horrible situations. Thank you for telling people what they can do to stop puppy mills! Excellent post. What a great event for awareness. The puppy mill reality is so very sad. What a sad existence for those sweet beings. We're very, very strongly against breeding in general. With so many dogs and cats needing homes desperately, it's just irresponsible and frankly, despicable to bring more into the world right now. Thank you for such an informative post and what a great event. I hope it raised awareness and I'm so glad to see those dogs out enjoying the fresh air finally after such a horrible undeserved start to life. It is so heartbreaking to read about poor dogs at puppy mill. Puppy mill should be completely put down. This is a great event to raise awareness. Thank you so much for sharing the story. I think I love those guys! Ann you look real tough! I love dogs too and only wish for them to be reared in a free caring environment. These people are all doing brilliant work. Nowadays in UK there are no dogs or cats allowed to be sold in pet shops. However there are still too many scumbags who have puppy farms where the animals are reared in appalling conditions. What a great event! Thank you for posting about this, and the important message everyone there was sendning. We sure wish more people would adopt, rather than shop for, their pets.